Engendren Corporation (FKA IEA, Inc.) has been operating in the Business Park of Kenosha since 2007, and in Kenosha County since its founding in 1985. It’s no stranger to the growing Kenosha community and pro-business climate of Wisconsin. Due for facility lease renewal or relocation, Engendren Management reevaluated its headquarters facility and location and found compelling reason to enter into another long-term lease renewal. Engendren has doubled-down on its lease engagement, committing seven more years with an option to extend its term in the 175,000 SF building. What were some of those reasons? Upcoming investments include equipment that will both broaden manufacturing capabilities and promote process efficiency at Engendren. Additionally, the Engendren team is growing. The current count is 110 team members with new position openings throughout the organization – finance, engineering, sales, and assembly to name a few. While these positive changes are happening, one thing remains the same; Engendren is proudly Made In Wisconsin. Engendren Corporation is the parent company to IEA, ArcRon, and Silver Linings Systems. IEA designs and manufactures radiators and heat exchangers for stationary and off-highway diesel engines. ArcRon designs, fabricates and powder coats, simple and complex metal components and assemblies. Silver Linings Systems designs and manufactures modular data center enclosures and related cooling equipment. For more information, please visit Engendren.com. Every organization needs a theme song… a rallying cry… a phrase or acronym that encapsulates the principles that define its style. Where would the Boy Scouts be without “Be Prepared”. Building a productive culture at Engendren has always been of key importance to me, but I’ve never really had a clear and precise way of bringing together all the elements I felt were fundamental to the “lifestyle” I wanted for the company. We needed a single term that everyone could remember, relate to and apply to their individual work. But we didn’t have one…until now. I had probably been subconsciously mulling over an entire glossary of words until one morning, just as I was finishing my low carb, ketogenic breakfast, they all came together in a single, captivating acronym. By itself, that word presents a daily challenge to each employee to do more, do better, go beyond, make a bigger contribution than you were planning when you walked in the door that morning. But beyond that, each letter within that word can be used to describe a vital organizational value, defining how each individual can personally make Engendren the most positive workplace possible. It defines the proper attitude to exhibit when working with each other, embodied in the concept of “emotionless dialogue”. It’s OK, actually desirable, to be passionate about what you do. But when interacting with colleagues, we must honor their opinions through calm and reasoned discussion. Other demonstrations of respect are things like showing up for meetings prepared and on time or leaving common areas cleaner than when you found them. A respectful organization avoids the “personality wars” that can sap vitality and impede improvement. Instead, it serves as a platform for energizing brilliant employees and maximizing their creativity. Empowerment, to both those who are empowered and those who do the empowering, is an essential element to job satisfaction, personal growth and optimum performance. In an environment that practices empowerment and delegation, work tasks, no matter what they may be, naturally find the most appropriately responsible person to perform them. Some like and excel at tasks that others dislike or are not well-suited to perform. Empowerment sorts out the work to those who enjoy and will “rock” what they embrace, enhancing satisfaction and productivity. I think of it as somewhat of a law of human nature. Why break a law that makes life better for all? Empowerment has both an active and passive perspective. Everyone is encouraged to thoughtfully delegate. Those who are thereby empowered must embrace the authority and responsibility conveyed. Eventually it brings an end to the “Not My Job” syndrome, and provides tangible and meaningful incentives for wide-spread skill development and career growth. Everybody wins again. Terrific. I also believe in a couple other laws of human nature, and wish to apply their great strength: Taking pride in our accomplishments, and the fact that the more we achieve, the more we seek to achieve. With careful assignment of responsibility for personal and company goals, accountability is the lynch pin to receiving credit for jobs well done. Accepting accountability is a noticeable way to demonstrate willingness and ability to be a leader, the one who keeps things moving forward and is eligible to receive proper recognition for the results. Repeated success when one is accountable builds confidence to take on ever larger challenges, producing more rapid and larger scale growth along with job and life satisfaction. As a manufacturer of highly engineered and custom-designed product, our existence is dependent on a consistent flow of new ideas --- and their effective evaluation and implementation. Creating new concepts goes beyond product itself into the way the business is operated, how it’s structured, and to its ability to react to changes in market conditions. The flexibility and opportunity that innovation provides has maintained us in the past, and it will form our future. In this context, health has many facets; a healthy business, physical health for the employees supported by a healthy and safe work environment, a healthy outlook for the future, a healthy attitude about one’s job and healthy opportunities for career growth. At the core of each iteration sits the comforting feeling of happiness, the assurance that all is well and it’s even going to get better. Happiness is often thought of as how we feel after some event occurs; after we get that raise, buy a new car or hunting rifle, adopt a puppy, go on vacation, get married, have a child … then we’ll be happy. But happiness should occur during the journey, not just when we reach the destination. Achievements and assets come with a happy and healthy life; not the other way around. As a result, healthy happiness is the ultimate currency. And I’m certain that as we, together, embrace the REACH concept, we’ll all be “richer”. Watch for updated posts on our certain progress. In the meantime, I hope your life is filled with REACH as well. Customization has long been a hallmark of IEA’s competitive advantage. Our willingness and ability to design one-of-a-kind radiators helps our customers offer unique, high performance products to their customers, often resulting in the opening of new markets and increases in revenues and share. 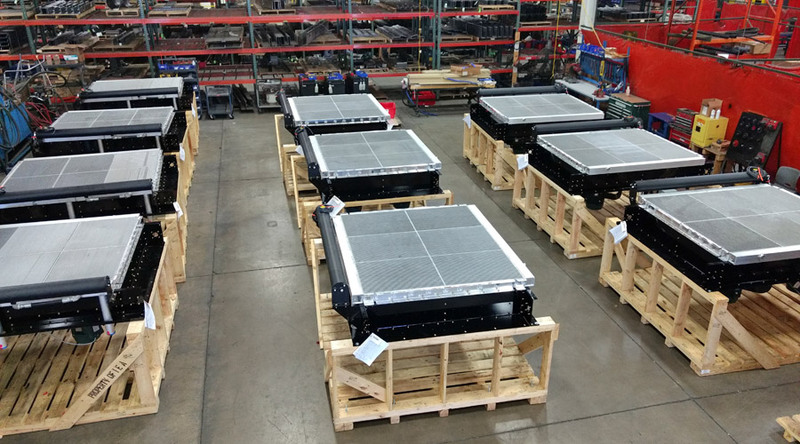 The first ten, highly specialized Cold Aluminum™ radiators sit on reusable pallets, purpose built to facilitate movement in and out of the end users facility, speeding and lowering the cost of their incorporation into a new standby, peak shaving energy product. We were recently involved in just such a project; developing a new, critical performance radiator design that was incorporated into a highly customized power generation system sold to a leading supplier of integrated, demand-response electrical generation systems. A major difference in this project is that rather than using our copper-brass products, it required application of our creativity and production skill with aluminum; specifically our Cold Aluminum™ product line. The challenge was to create an aluminum radiator that, placed in an extremely restrictive sound attenuated enclosure, would properly cool our customer’s low-emission, (and therefore extremely hot running), heavy-duty engines in an ambient desert environment temperature rated at 122ºF. As Al Meissner, our VP of Engineering, put it: “We have consistently met such standards with open gen sets, but because of our experience with enclosures, we knew there’d be significantly different obstacles. But being in the customization business, obstacles are what we’re all about”. Our engineering team’s knowledge of heat transfer, thermal dynamics and predilection to apply it in creative ways, combined with equally innovative manufacturing talents, lead to the creation of an application-specific bar-and-plate product that met all expectations: a 34 ft2 multiple NEMA motor driven fan-on radiator design, comprised of one 65.5” X 76.5” jacket water and two 55.5” X 22.5” dedicated engine bank charge air coolers. The total package, including the Cold Aluminum cooling sections, frame, surge tank and motor fan combination measured 95” x 81.5” inches overall with a dry weight of 2,000 lbs. Utilizing computer-aided design, the team created specialized outlet ducting configurations that maximized airflow while limiting noise to less than 70 dB(A) at 25 feet. They also applied preliminary prediction software that assured the units would perform as required prior to their being placed in the field. The net result of all design efforts were 420kW peak shaving generators with reduced footprints, operating with cooling systems that conformed to some of the industry’s most demanding durability standards. On the strength of the product’s performance, our customer signed a multi-year supply agreement with their customer worth multiple tens of millions of dollars, and added a valuable new relationship to their list of satisfied buyers. The radiators supplied by IEA were simply not available, at any price, from suppliers less committed to and competent in custom design and manufacture. We’re proud of being able to assist this customer in achieving such a positive result, and look forward to the next challenge to our skills with aluminum. We just learned that Engendren’s 2015 Medical Loss Ratio (MLR) was only 34%! A MLR is an important insurance industry metric that compares the dollar amount of claims made by the policy owner against the value of the premiums the owner paid. . A low number, like 34%, indicates how Engendren employees’ efforts at maintaining a healthier life style were particularly successful in 2015. It’s solid evidence that the program I described in my blog of January 25, 2016 (No 2016 Health Care Benefit Cost Increase), can, and did, have a direct effect on the overall health of our employee group. Every late summer or early fall, our brokers and insurers work together to calculate our health insurance premiums for the following calendar year. The 0% increase in premiums we received for 2016 was based on our claims experience for the 12 months from Summer/2014 through Summer/2015. Our great employees obviously continued to smartly manage their health care costs through the last six months of 2015, which is what yielded that enviable 34% figure. These efforts bode well for 2017 to be yet another year of no increase in premiums. That will be 8 years in a row during which Engendren employees paid nothing extra for their health care coverage at a time when the health insurance industry in general is asking for significant price increases! Our track record is already unparalleled. Another year would be even more amazing. Stay tuned. Engendren and its employee team is enjoying 2016 as our 7th consecutive year with no increase in health insurance premiums… accomplished with only a couple of minor plan changes necessary to comply with the Affordable Care Act…changes that were barely noticeable to plan participants. Most importantly, our steady premium rate, realized in a health care market that regularly sees double-digit annual percentage increases, can only mean that our employees are spending less on health care. 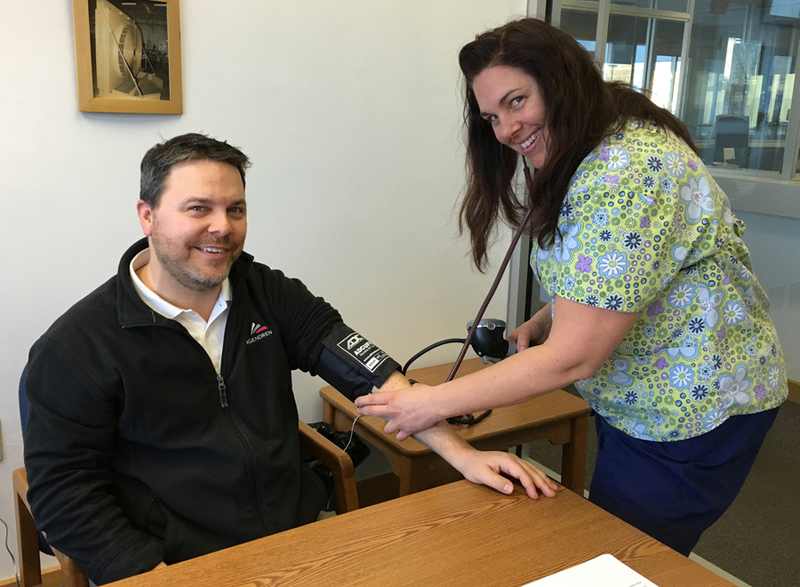 Linda Brand, Wellness Coach for Engendren, checks the vital signs of Dave Steck, Engendren’s Chief Sales and Operations Officer. Linda visits Engendren regularly to provide wellness coaching to any interested employee. Being able to spend less, our employees must be proactively taking care of themselves, and being ever-smarter consumers of health services… for which they deserve hearty “Congratulations”. Healthcare is frequently discussed in the context of wellness vs. illness. 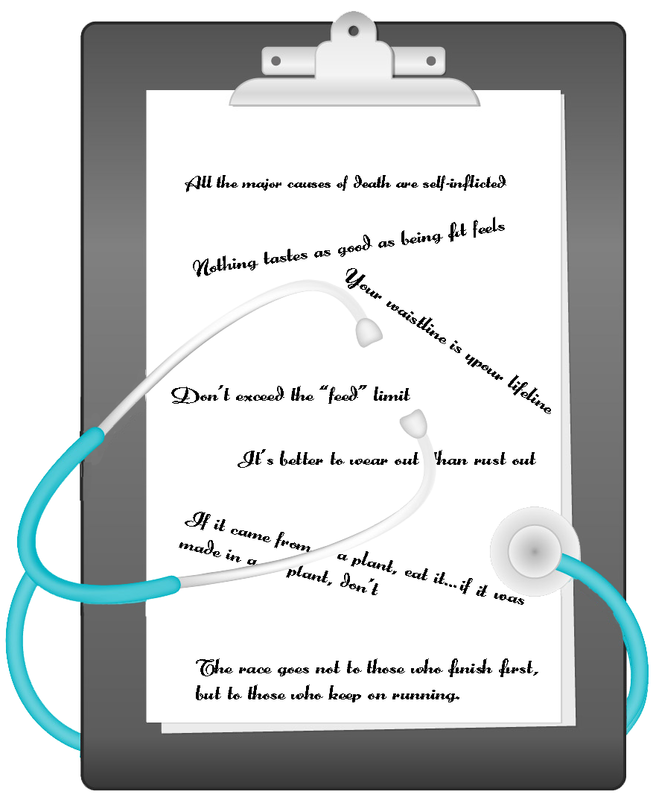 While the medical profession is well-equipped to care for us when we’re ill, staying well starts with the individual. Our astounding record of health insurance cost control is clear evidence of the enthusiastic employee participation in our wellness initiatives. One element of wellness initiatives was the January 6th “finger stick” blood test conducted on site at Engendren’s headquarters. Within minutes, every participant was given the results of his or her test. And those results were followed by an immediate consultation with our resident health care practitioner and wellness coach, Linda Brand. Linda did a great job of explaining what the blood test results meant and what lifestyle changes could be made to improve any of the statistics that were not in the optimal range. To maintain a focus on improving the numbers, Linda comes back to Engendren on a regular basis to follow-up with any participants that had less than favorable stats or anyone that just wants to consult with her*. A high quality of life has as one of its most basic elements high quality health . We’re thrilled by the countless wellness improvements made by employee participants and the immeasurable benefits they are enjoying now, and will enjoy in the future, as a result of those efforts. *Linda is not an employee of Engendren, does not retain health information shared with her and does not report any health information to Engendren. Any information provided by participants to Linda is confidential between those participants and her. I have a huge appetite for books and articles on business-related topics. Of particular interest are those that speak to job satisfaction and the primary factors that make our jobs and, by extension our lives, optimally interesting. Naturally, every employee is motivated by fair compensation, benefits and having a safe and comfortable work environment. But even with all those in place, the day-to-day routine can become increasingly mundane when there is no adequate sense of purpose. Sure, everyone has an obvious purpose in their daily role. Welders weld. Fabricators assemble. Engineers design. Accountants record and report. Maintenance teams keep the equipment running. But it’s the bigger purpose to which all those actions contribute that we don’t think or talk about enough. That’s why I’m writing this post… to remind our employees, sales reps, suppliers - everyone on the Engendren / IEA / Silver Linings Systems team - that what they do every day make mission critical impacts. Our products are critical elements in sophisticated systems that protect and optimize thousands of mobile and stationary power generating and data center installations around the world. Every day, across the globe, our products ensure that hospitals have power, data centers operate without interruption 24/7 and people in developing countries have the municipal power they need. Our products help the most remote towns with lighting and heat, and universities to operate even when their local power grid fails. Rescue and rebuilding efforts after natural disasters often commence almost immediately thanks, in part, to huge mobile power generators that our products support. Others of our products house, cool and manage computers that support the most advanced mobile military technology on duty in some of the most dangerous places on earth. Countless cellular networks, social media sites and apps, and video streaming rely on our equipment 24/7 to support the functionality of the devices with which billions of people run their lives. Furthermore, what we produce is expected to perform, without fail, in the hottest, coldest, highest, lowest, driest, wettest and otherwise harshest environments. Our products are so much more than huge manufactured assemblies of perfect parts. They are essential contributors to a safe, secure and prosperous world that grows increasingly dependent on their technology and quality.